Since the founding in 1966, ITB Berlin has established itself as the guidance system of the global travel industry. The brand ITB Berlin has a firm place in the calendar of everyone who loves travel professionally and personally. ITB Berlin is “The World’s Leading Travel Trade Show®”. Efficient technological solutions are increasingly becoming a decisive factor in successful travel industry business models. 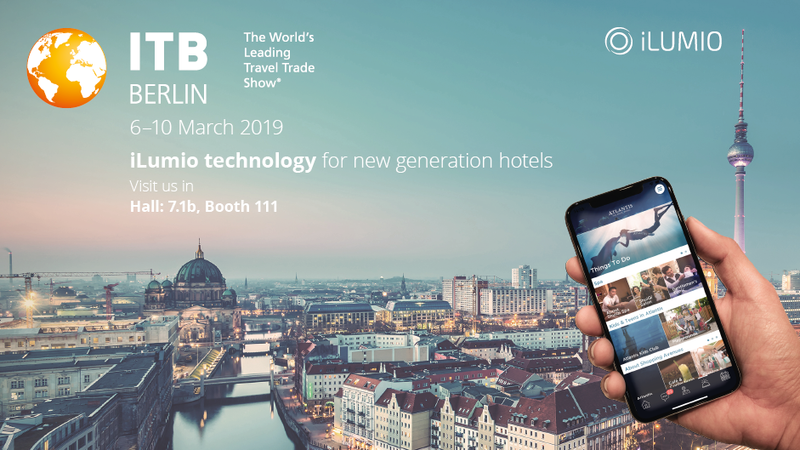 The ITB Berlin segment Travel Technology features four halls where providers present their global distribution systems (GDS), tour operator databases, reservation systems, travel agency software and calculation programs. Welcome to our stand – come to talk with our experts from iLumio and learn how to improve guest experience. We are ready to present our visitors, technology for new generation hotels. Our solutions cover full guest life cycle, from gathering guest preferences before arrival, to mobile check-out. Do you know our solutions: iLumio Smart Digital Signage, customized iLumio Mobile Concierge, iLumio Valet for in-room automation control and user-friendly iLumio TV? iLumio provides full system for interactive guest service. Check our ITB exhibitor profile. You find us at: Hall 7.1b, Booth 111. Drop your business card on our booth! We will draw one winner on March 8th, 2019. If your card gets drawn, you get a 1-YEAR basic license with iLUMIO MOBILE APP for your hotel.